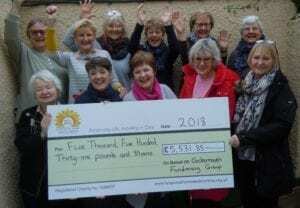 Our Cockermouth fundraising group raised £5,531.85 for Hospice at Home West Cumbria in 2018. Most of the money was raised through the sale of popular knitted novelties which were filled with chocolates and sold in local businesses at Easter and Christmas. To keep up with demand the group knit all year round and are able to use wool which has been donated to the Hospice at Home West Cumbria Shops. The group meets on the first Monday of the month at Croft Bowling Club and would welcome new members to help with the knitting. For more details call volunteer co-ordinator Teresa McCall on 01900 873173 or pop into the Hospice at Home Shop in Old Kings Arms Lane, Cockermouth.